FansBet is a one-of-a-kind sportsbook, not a traditional betting site. It's the only bookmaker that is committed to sharing 50% of net profits with fans. Plus, they are hosting Fantasy Football tournaments and freerolls. Fansbet is an innovative and fresh approach to a sports betting brand. It is licensed and regulated by the UK and Maltese Gambling Authorities. This bookmaker provides betting opportunities on a whole range of sports and a lot of cool promotions that offer real value to all their customers. Other than the usual sportsbook odds on every major sporting event, bonuses and promotions, Fansbet is the online bookmaker that shares 50% of net profits with fans and hosts Fantasy Football competitions! Let's take a look at the Fan Partner Scheme and Fantasy Football competitions! FansBet is a betting site where you and supporters of the team you love can always benefit, even if you don’t back a winner. FansBet is a one-of-a-kind betting platform, the only bookmaker in the world which creates a bond with sports fans by committing to share half of its net profits directly with supporters. It is the only bookmaker that is committed to sharing 50% of net profits with fans. You simply type in your club when registering then choose your local fan partner/club/organisation to receive funds on a quarterly basis - we track your bets and do all the hard work. FansBet work towards forming a genuine bond with fans by teaming-up with trusted and accredited fans groups and committees, who themselves decide where and when the money returned to them will be spent to help fans. Whether that might be to help raise funds to buy a stake in their club, subsidise tickets, travel or other important supporter-related issues. One of the most eye-catching aspects of Fansbet - other than the aforementioned scheme by which money from losing bets is returned to fan associations connected to the club that the given member supports - is the Premier League fantasy game that lasts right through the season. The FansBet Premier League Fantasy game is similar to the other football fantasy brands in terms of rules, but the big difference is that the FansBet version gives you the chance to win a share of a huge prize money. There's a £100,000 guaranteed prize pool, and with the buy-in being just £22, it's a tempting feature that could help to make your time on Fansbet even more interesting over the coming year. Like any Fantasy Premier League game, the Fansbet version offers you the chance to pick your team of players and win points based on their performances in real life Premier League games. However, with Fansbet there are prizes on offer! You can enter up to 10 teams into the league at a price of £22 per team but your first entry is totally free if you join Fansbet via our link! 1. Go to FansBet via this special link. 3. Set up your first team (for no fee). 4. Set up any other teams you want to enter at £22 each. 5. You get £100 million to build your team. Of course, there are tons of other customised tournaments: freerolls, weekly, monthly and season-long competitions with huge prizes to be won! FansBet was started by a group of passionate football fans who love their clubs, love a bet and wanted to combine the two passions, so they did. The odds can be considered to be average. Cash out is available on all markets. Live betting on the site is comprehensive: Clicking on in-play at the top of the Sportsbook Homepage will take you straight to all the action going on around the world at any given moment. 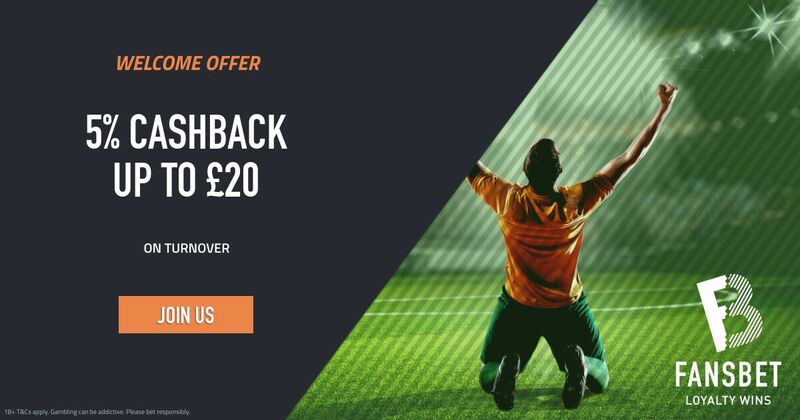 Fansbet are also currently offering a tasty Welcome Bonus to all new puntes: Make a 1st deposit of £20 or more and get 5% cashback on sportsbook turnover. All of you who haven’t already joined Fansbet can do so and claim your Welcome Offer! 2) Make a 1st deposit of £20 or more and get 5% cashback on sportsbook turnover. 3) All real money bets placed at odds above 3/4 (1.75) will trigger cashback. 5% of the stake will be refunded when the bets are settled. 4) To convert earned Cashback to cash; go to ‘My Profile’, click on ‘Bonuses’ then ‘Convert’. Fansbet also offer Colossuss Jackpots! You can try to win the world's biggest sports jackpots, from the £5M Colossus to the 1 million Pick 6 jackpot, from the daily horse racing jackpot to the weekly NFL Colossus jackpots and the Freeplay 6, a free to play competition with a £1 million guaranteed prize. Where Can I Find the Best Betting Offers? "How Does FansBet Work? Profit Sharing & Fantasy Football Explained"